If you missed seeing Action! 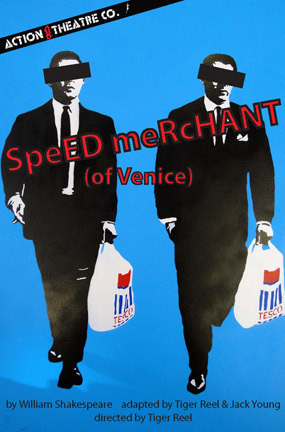 Theatre Company’s Speed Merchant (of Venice) at the Hollywood Fringe Festival last month, you’re in luck. The company will present two additional performances at Theatre Asylum: Saturday, July 14 at 8:30pm and Sunday, July 15 at 5:00pm. Named “Best of Hollywood Fringe,” this 90-minute adaptation of Shakespeare’s Merchant of Venice is directed by Tiger Reel and adapted by Reel and Jack Young, Head of the University of Houston Professional Actor Training Program and Houston Shakespeare Festival Associate Artistic Director. Attacking Shakespeare’s most controversial story with their customary imagination and visceral staging, Action! Theatre Company presents the tale of corporate killer, Antonio. Antonio enters into a deal with Shylock, a Jewish moneylender, in order to help his former lover take part in “The Lottery”, a reality game show, to vie for the hand of a beautiful heiress. Taking inspiration from the recent tales of corporate malfeasance and the reality show antics of the Kardashians, Speed Merchant (of Venice) is a 90-minute sprint through one of Shakespeare’s nastiest comedies. Speed Merchant (of Venice) stars Jack Young as Shylock, Abbie Cobb (ABC’s Suburgatory) as Jessica and Vanessa Vaughn as Portia. Also featuring Orestes Arcuni, A.J. Diamond, Keith Edie, David Hardie, Ted Heyck, Samantha Klein, Tom Metcalf, Nicholas Mongiardo-Cooper, Chris Triana and Jon Weinberg as Antonio. Performances will take place at Theatre Asylum, 6320 Santa Monica Blvd., Los Angeles, CA 90038. Click Here for tickets ($15).